Forests provide an essential resource to the livelihoods of an estimated 20% of the global population. The contribution of forest ecosystems and forest-based resources to poverty reduction is increasingly emphasized in international policy discourse and conservation and development investments. However, evidence measuring the effect of forest-based activities on poverty outcomes remains scattered and unclear. Lack of systematic understanding of forest-poverty relationships, in turn, inhibits research, policymaking, and efficient financial resource allocation. To identify relevant studies for inclusion in this systematic map we searched six bibliographic databases, 15 organizational websites, eight systematic evidence syntheses (reviews and maps), and solicited information from key informants. 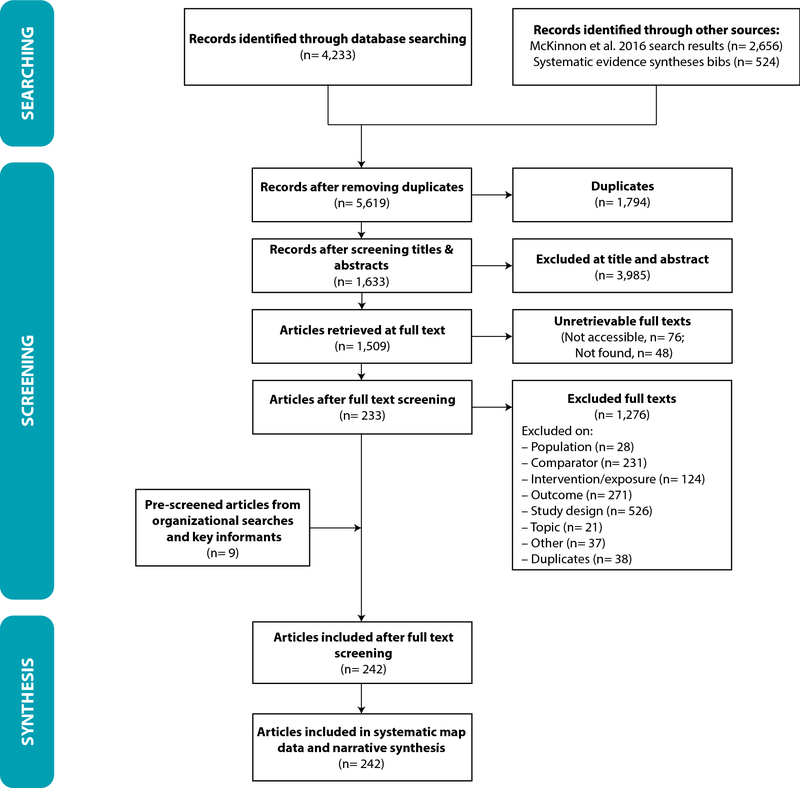 Search results were screened for relevance against predefined inclusion criteria at title, abstract, and full text levels, according to a published protocol. Included articles were coded using a predefined framework. Trends in the evidence, knowledge gaps and relatively well-researched sub-topics are reported in a narrative synthesis. Occurrence and extent of existing evidence about links between interventions and outcomes are presented in a visual heatmap. Data are available through the open access Evidence for Nature and People Data Portal (http://www.natureandpeopleevidence.org). A total of 242 articles were included in the systematic map database. 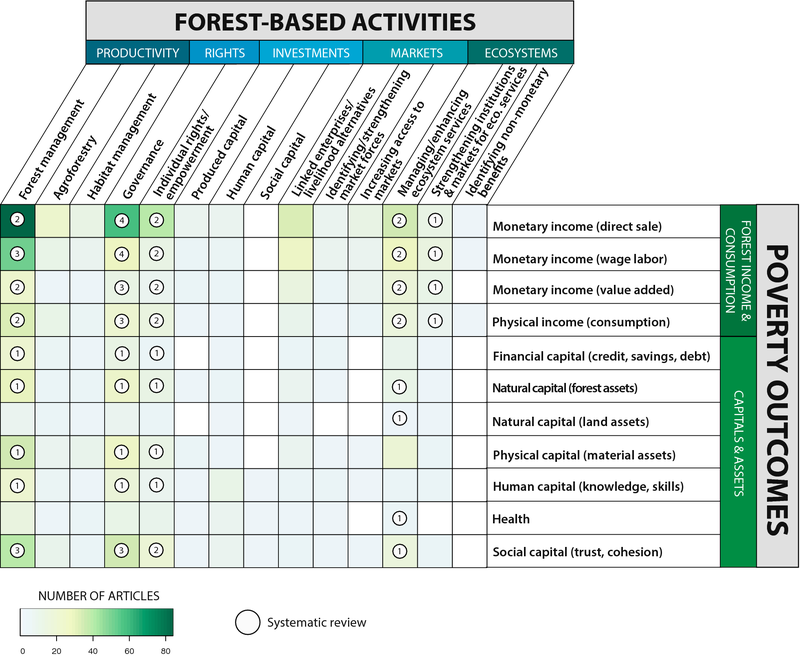 Included articles measured effects of 14 forest-based intervention types on 11 poverty dimensions. The majority of the evidence base (72%) examined links between productivity-enhancement strategies (e.g. forest management, agroforestry, and habitat management) and monetary income and/or social capital outcomes. Other areas with high occurrence of articles include linkages between interventions involving governance, individual rights/empowerment or linked enterprises/livelihood alternatives with impacts on monetary income from direct sale of goods. A key knowledge gap was on the impacts of investment-based interventions (i.e. enhancing produced, human, and social capitals). Another was the impacts of forest-based interventions on financial capital (savings, debt), non-monetary benefits, and health. The evidence base on forest-based productive activities and poverty alleviation is growing but displays a number of biases in the distribution of articles on key linkages. Priorities for future systematic reviews and evaluations include in-depth examinations into the impacts of rights-based activities (e.g. governance, empowerment) on poverty dimensions; and productivity-enhancing activities on social capital. More comprehensive and robust evidence is needed to better understand the synergies and trade-offs among the different objectives of forest conservation and management and variation in outcomes for different social groups in different social-ecological contexts. Forests comprise a key natural resource to help reduce poverty and advance other UN Sustainable Development Goals [1, 2]. International investment in forest conservation and management increased markedly beginning in the early 1990s [3, 4], with major funding directed toward sustainable forest management , and reducing emissions from deforestation and forest degradation (REDD+) projects , among other efforts. Given the importance of poverty alleviation for national governments and many international organizations, forest-related economic investments have also sought to contribute to this goal. It is estimated that approximately 20% of the global population (~ 1.3 billion) relies on forests and forest products to support some portion of their livelihoods, from sources of income and building materials to primary supply of food and water [7, 8]. A large proportion of the population living in or near forests in low-income countries remains below the poverty line . Large donors such as the World Bank Group are now explicitly supporting forest-based poverty alleviation strategies through investment lending operations, technical assistance, and analytical work . While the link between forest resources and poverty is explicitly stated in numerous declarations, mission statements, and strategies, the nature of the relationships between ecosystems and poverty is complex with linkages and mechanisms connecting them not clearly defined [11–13]. In part, the multi-dimensionality of poverty poses a significant challenge for policy development and implementation. Poverty can be defined as the deprivation of well-being related to lack of material income or consumption, low levels of education and health, vulnerability and exposure to risk, lack of agency, and powerlessness . Thus, alleviating poverty through environmental improvement will require clear hypotheses about how these different aspects of poverty respond, both individually and synergistically, to dynamic environmental and socio-economic factors, including ecosystem health, ecosystem service delivery, livelihood diversification, governance and access rights [14, 15]. Existing research shows that forests provide an essential contribution to the livelihoods of both rural and urban communities [8, 10, 16, 17]. Forests can be assessed according to three different roles in relation to poverty alleviation: (1) by offering subsistence, through incomes and consumption, (2) as a “safety net” to prevent people from sliding into or further into poverty and (3) as a pathway out of poverty [16–19]. Estimates of dependence on forests vary, with studies suggesting that forests may contribute from a fifth, to more than a quarter of incomes among households living near forests . The level of dependence on forest income varies based on regional, governance and ecological factors [14, 20]. Beyond income, forests can provide ecosystem services such as clean waterways, sustenance, recreation, and culturally important sites that can benefit society through promoting improved human health, physical security, empowerment, cultural integrity, individual happiness and social relations . However, utilizing forest resources to alleviate poverty also promotes increased use of limited resources, raising concerns over trade-offs between conserving ecosystems and achieving improved human well-being [12, 22, 23]. Careful consideration of how to negotiate such trade-offs is needed. However, relatively little is known about how forests can serve as a pathway out of poverty let alone to more widespread prosperity through sustainable income streams and other means . New holistic frameworks, such as the PRIME  are now available to help conceptualize and analyze forest contributions to poverty reduction. PRIME describes how a forest landscapes approach is needed to understand the pathways through which forests contribute to poverty reduction outcomes. It illustrates five primary pathways—productivity, rights, investments, markets, and ecosystem services—and is being applied by World Bank Group forest project development teams in several countries. However, understanding when and where these pathways are best suited (whether individually or synergistically) to achieve improved poverty will require evidence derived from empirical evaluation of impacts. Several syntheses documenting empirical evidence on the relationships between forests and poverty are available, but they have remained limited in scope, focusing on one type of forest intervention and/or a single dimension of poverty [25–28]. Two evidence gap maps recently examined the impact of forest conservation  and land use change  on environmental and socio-economic outcomes, including poverty within a subset of forest types. While these efforts to characterize evidence on the linkages between forests and poverty are encouraging, they are still limited in geographic scope (concerning low- and middle-income countries only), and range of interventions (including only policies and programs or conservation actions) examined. Our study aims to examine the evidence on forest-based activities and poverty outcomes more broadly, in order to identify gaps in potential pathways and mechanisms across scales, by which forests can help the poor. In particular, this broader scope provides the opportunity to clarify what is known around the application of different approaches across different contexts, facilitating better understanding how to scale up. This study therefore aims to collate existing evidence on forest-poverty linkages globally, identify gaps in the knowledge base, and communicate results to researchers and decision-makers. Clarifying and strengthening knowledge on the contribution of forests to poverty reduction is vital for informing forest-related policy, research and investment affecting forest ecosystems in countries around the world. What evidence exists for the role of forests in contributing to poverty alleviation? What are some critical gaps in the available evidence? This question was scoped and set by the review team, including individuals from the World Bank’s Program on Forests who commissioned this systematic map. The scope of the question was then discussed by a larger group of experts from this field including those in research and in conservation and development practice, to ensure that the question reflected the broad needs of the sector. What is the distribution of the evidence base in terms of overall quantity of articles, study design types, interventions examined, outcomes measured, governance regimes, ecoregions, and geographical locations? What types of forest-based programs have been studied and how much evidence is there from different types of research? What indicators are commonly used as measures of poverty in this area of research? What are the major gaps in the evidence base that represent research priorities? What are promising areas for future synthesis? Population: Discrete human populations living within or near forested or formerly forested areas from all nations. Intervention: Forest-based productive activities (see Table 1). Comparator: Temporal (before/after, continuous time series, interrupted times series), spatial (distance), or between groups (control/intervention, socioeconomic, gender, racial/ethnic). Outcome: Measures of poverty in terms of forest-based income, consumption, capitals and assets (see Table 1). Study type: Experimental, quasi-experimental, non-experimental, systematic reviews and maps, evidence gap maps. Given the scope of the systematic map, we did not attempt any critical appraisal of individual studies, nor did we try to quantify or validate direction of impact for poverty outcomes examined. Rather, this map is intended to provide insight on potential knowledge gaps and biases. Moreover, while many other syntheses on this topic area have aimed to examine the occurrence of trade-offs and synergies between poverty and other economic or environmental outcomes (e.g. ), the scope of this map does not explicitly examine these interactions as we are not examining direction of impact. Kappa statistics were not calculated between reviewers, but disagreements in coding between a team of three reviewers were discussed and reconciled with the broader research team during the training phase. An additional data field on presence/use of a conceptual model/framework to frame study, shape methods, and/or analyse findings was added to the data coding strategy. Multiple online information sources, relating to published and unpublished reports, were searched in order to capture a comprehensive and unbiased sample of literature. In total, six publication databases, 15 institutional and organizational websites, and the bibliographies of eight systematic evidence syntheses were searched between October 2016 and March 2017. Given the multiplicity of disciplines at the intersection of forest and poverty research, substantial terminological diversity regarding actions and outcomes is likely to exist. In order to maximize comprehensiveness of our search to capture the breadth of ontologies, the search string was co-designed and tested by an interdisciplinary review team from different disciplinary backgrounds (e.g. economics, social science, natural science) and sectors (e.g. conservation, development, non-profit, academic). Comprehensiveness was checked by how many articles were recovered from the test library (19 out of 25). Search terms were limited to English language due to project resource restrictions. The following search string was used to query online publication databases, organizational websites, and internet search engines. This systematic map builds from a previous systematic map on linkages between conservation and human well-being . Given the expanded scope of this map, our search strategy was conducted in stages to first take advantage of existing work, followed by additional searching to strive for comprehensiveness. We first examined both included and excluded literature from the McKinnon et al. systematic map. Then, we extended our search to six major publication databases (Web of Science, Agris, AGRICOLA, GreenFile, EconLit, and CAB Abstracts), including nine indices in Web of Science, which cover natural and social science areas. Details on search settings and subscriptions can be found in Additional file 1. We only searched these databases for articles published between 2014 and 2016, reflecting time not covered by the McKinnon et al. systematic map. Searching was performed on November 30, 2016. Additional searching was carried out in Web of Science from 1900–2014 to capture any articles missed by the McKinnon et al. search (conducted on March 3, 2017). Grey literature was identified from a list of organizational websites and topical databases (Additional file 1) using the full search string when possible. When search functions were limited, we used an abridged version of the search string (“forests” AND “poverty”). Lastly, given the number of existing systematic efforts on subsets of this topic, we screened bibliographies of related systematic evidence syntheses for relevant articles [25, 26, 27, 29, 30, 33–35]. Due to the volume of articles meeting inclusion criteria, we did not screen cited literature within included articles for inclusion in this study. After compiling results from the search strategy, recovered articles were screened according to an established set of eligibility criteria (Table 1). Intervention and outcome categories are based on working frameworks—PRIME  and the Forestry modules published by the FAO, CIFOR and the World Bank Living Standards Measurement Surveys team —for forest-based productive activities and dimensions of poverty. All articles must meet all inclusion criteria to be in the final dataset. All articles were screened in EPPI Reviewer 4.2 Titles and abstracts were screened by three researchers (SHC, KM, PR) with 10% of titles and abstracts screened by at least two reviewers. All screeners screened 20 titles and abstracts as a training set to ensure consistency in screening. Disagreements between reviewers occurred in ~ 30% of double screened titles and abstracts. If inclusion could not be resolved by the review team, a second opinion was sought from the author team, and resolved by consensus. At the full-text screening stage, two researchers examined ~ 5% of articles (n = 11) together to ensure consistency, following the same set up for team-based review for inclusion. Given the broad scope and size of this systematic map, we did not assess individual articles for quality (e.g. reliability and relevance based on study design). For the purposes of this study, we did not distinguish between articles and studies, with all articles treated as a single case study. While articles could have reported on multiple studies, these were not prevalent in our dataset as they would have been excluded as non-systematic reviews or meta-analyses. Each included article was coded with a standardized coding tool and codebook to extract relevant data (Additional file 2). This coding tool was piloted by two researchers (SHC, KM) for 11 articles to ensure consistency in extraction. Initial disagreement averaged around ~ 25% of extracted fields in the testing stage. These disagreements were discussed and additional, more detailed guidance was added to the data extraction questionnaire (Additional file 2) to ensure consistency between reviewers. Given the large volume of included articles at the title and abstract stage, double extraction of all articles was not conducted. Rather, the research team discussed uncertain and unresolved articles on a regular basis for collective resolution. In the case where articles authored by members of the review team were encountered, we ensured that authors did not screen nor code their own work. The coding tool was deployed in Google Forms to aid in consistency in recording data between researchers and articles. Extracted data was recorded in a comma separated file and parsed into a standardized format in R and analyzed using a customized script (https://github.com/scheng87/profor). 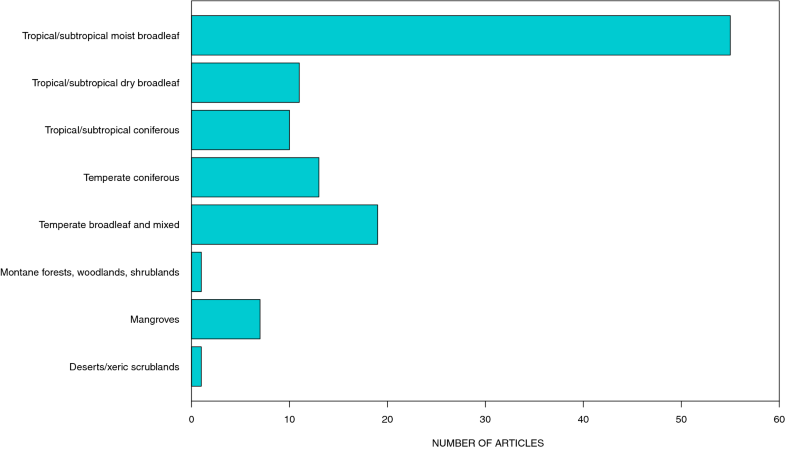 The following categories of data were extracted from each article. Unique article ID and assessor information. Information on forest-based productive activity. Information on design, scale, and location of study. Information on poverty outcomes including indicators used. Information on causal mechanism (if available). Study design was coded based on the following criteria adapted from Margoluis et al. : (1) data type (quantitative, mixed); (2) random assignment of treated group (yes, no, unknown); (3) presence of comparison group (yes, no, unknown); (4) comparisons conducted over time (punctuated, continuous, before/after). This classification is not intended to infer quality of study design but to facilitate assessment of articles in terms of whether they demonstrate internal and external validity. As we are interested in examining articles that attempt to examine cause-and-effect relationships (i.e. links between forest activities and poverty), we are particularly interested in articles that use counterfactual to attribute observed outcomes to an action/intervention [39, 40]. The systematic map does not quantify or validate direction of impact for poverty outcomes examined but aims to describe the distribution of research effort over forest-poverty linkages. Thus, in order to understand how different poverty dimensions are measured, we recorded textual data (if available) on the types of indicators used. This data was categorized into common themes by the research team. The distribution of the evidence base was compiled into a structured heatmap (or “systematic map”) of linkages between individual intervention and outcome types. Evidence on outcomes (rows) were mapped on to different categories of interventions (columns). 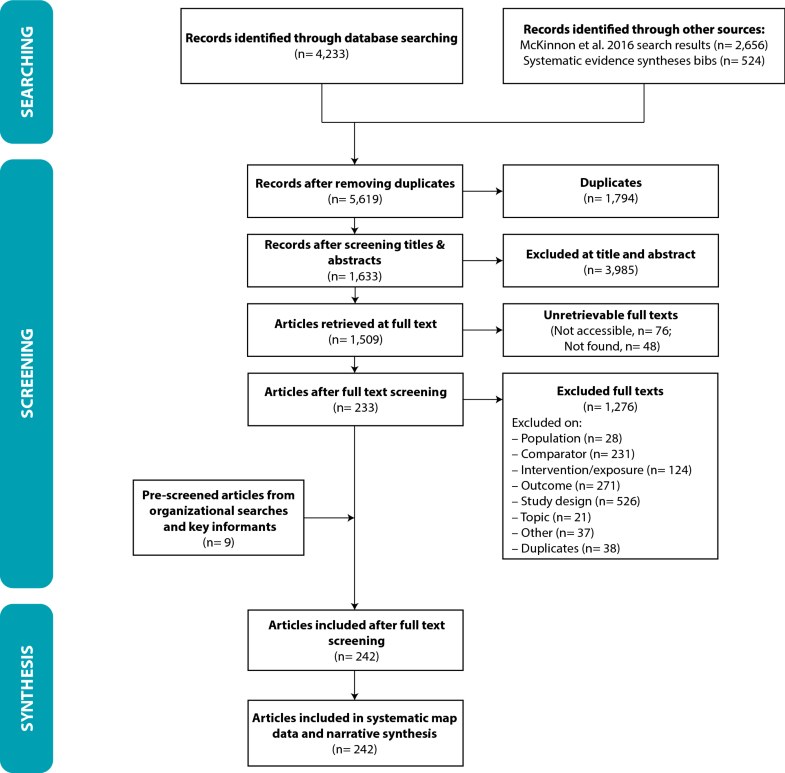 As articles can examine links between more than one intervention and outcome type, individual articles were mapped to more than one cell when applicable. Figure 1 details step-by-step results of the systematic mapping process. Database and bibliographic searching yielded 5619 unique results, but most were excluded due to irrelevance (~ 2600 articles) (Fig. 1). Non-database searching yielded 70 potentially relevant articles, of which nine met the inclusion criteria. This type of supplementary searching tends to turn up both peer-reviewed and grey literatures, and we ultimately included an additional five peer-reviewed and four grey literature sources from this search strategy. At the full-text screening stage, most studies were excluded due to inappropriate study design to attribute causality (~ 41% excluded articles), such as lacking a comparator or poorly designed comparators (e.g. comparisons across sites without matching or accounting for differences) (n = 231). Ultimately, 242 articles were included in the final map (full bibliography in Additional file 3). Bibliography of excluded articles with exclusion criteria is listed in Additional file 4. Coded data for all included articles are included in Additional file 5. A ROSES reporting form is included in Additional file 6. Few articles were published prior to 2000, with the volume of articles published increasing steadily from 2000 to 2013, with a slight decrease in the rate of publication since 2014 (Fig. 2). Included articles used a range of different comparators to examine the contribution of forest-based activities to changes in poverty over time, space, and populations (Fig. 3). Most of the studies employed a non-experimental study design (76%). Approximately 35% of articles (n = 85) compared effects of the intervention over time (either before/after, or over a time series) while a majority of articles compared effects between groups and/or presence/absence of intervention (65%, n = 158). However, only 49 articles employed a control—either set a priori or observed explicitly post hoc. Overall, about half of the primary research articles used a combination of quantitative and qualitative methods to examine change in poverty over time (n = 122, 52%). Included studies in the systematic map span a range of geographic areas (Fig. 4). The most studied areas are South Asia, East Asia, Southeast Asia, South America, and East Africa, while Europe, North America and West Africa had relatively few articles. The five countries with the most articles are Nepal (n = 38), China (n = 25), India (n = 25), Bangladesh (n = 16), and Brazil (n = 12). Together, they account for ~ 44% of all included studies. Articles included in this study only documented explicit forest and biome type haphazardly using inconsistent typologies and terminologies. We were unable to extract information on forest type from 42% (n = 97) and biome from 61% (n = 143) of articles. When explicitly indicated, tropical/subtropical forests were most frequently studied (79%, n = 68 out of 87) (Fig. 5), while recorded forest types were mostly secondary or regenerating natural forests (Fig. 6). As forest interventions can be complex, articles can be classed into multiple different sub-categories of forest-based productive activities. In general, the productivity, rights, and markets strategies from the PRIME framework are the most studied, however, concentration of evidence is focused on activities in specific sub-categories within these strategies. For example, forest management (P), governance (R), individual rights and empowerment (R), and managing and enhancing ecosystem services (E) were well-studied. Comparatively, few articles examined activities aimed at enhancing capitals (produced and social) (I), utilizing and harnessing market forces (M), and protecting and augmenting non-monetary benefits (E) (Fig. 7). As forest interventions are rarely one-dimensional, and often include a wide portfolio of activities and objectives, articles often examined multiple interventions (75% examined more than 1, n = 175). The interventions that were most commonly studied within a single article were: forest management and governance (n = 33), forest management, governance, and empowerment (n = 17), and empowerment and governance (n = 10). For example, institutional forms of forest management that combine these types of approaches include forest user groups or Joint Forest Management. In practice, this appears in implemented programs for example in the Grain for Green Program and the Sloping Land Conversion Program in China. Overall, most articles examined some element of monetary income, whether from sales, wage labor, or value addition (Fig. 8), with the majority focusing on monetary income derived from direct sales. Commonly measured capitals and assets included changes in social capital (e.g. relationships, trust, conflict, empowerment), physical capital (e.g. material assets), and natural capital (forest-based assets). Land-based natural capital and health were not as commonly examined. Overall, a little less than 50% of articles disaggregate measurements of outcomes across different sectors of society (n = 120). Amongst these articles, most examine differences in poverty impacts across different socio-economic groups (e.g. poor versus not poor, economic stratifications) (Fig. 9). Comparatively, far fewer articles examine heterogeneity in outcomes across race/ethnic groups or gender groups in a landscape. Outcomes were measured using a wide variety of indicators, with most revolving around measured and perceived changes in access, availability, and use. Common indicators used to measure changes in income, consumption, capitals and assets are detailed in Table 2. 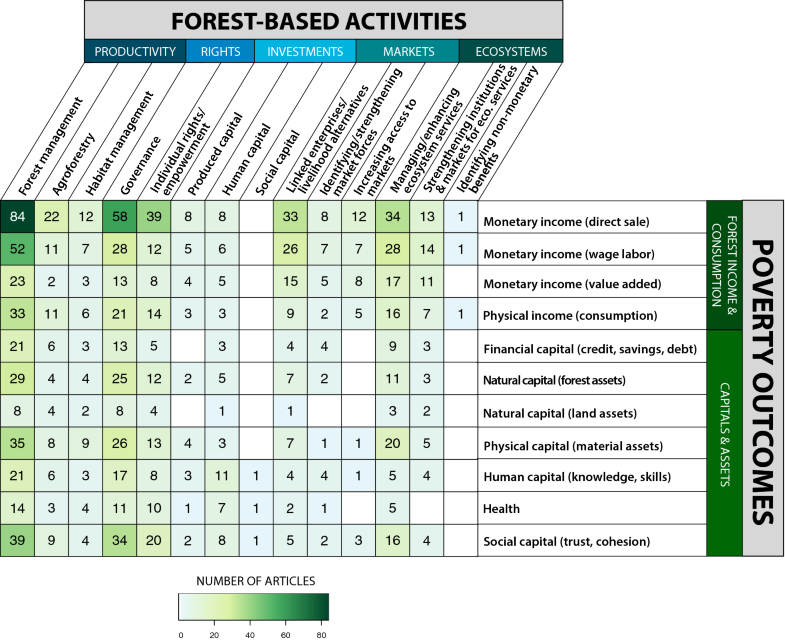 The systematic map at the center of this study is presented as a visual heat map of the distribution and frequency of linkages across the framework of forest-based productive activities and poverty dimensions. Linkages with darker colors indicated higher occurrences of articles while lighter colors indicate lower occurrences (Fig. 10). Forest management, agroforestry, and habitat management (P) and their links to monetary income and to social capital—i.e. the P component of PRIME—are the most commonly studied productivity-enhancement strategies in the literature. The majority of included articles (75%, n = 174) examined linkages between “P” activities and its relationship to monetary income, and to some extent, to social capital. Other frequently explored linkages were those between governance, individual rights/empowerment (R) and linked market-based enterprises/livelihood alternatives (M) with monetary income from direct sale of goods and/or changes in social capital (Fig. 10). Other pathways were less studied. For example, only 32 articles looked at investments in public services and infrastructure with very little evidence on the links between these actions and monetary income through direct sales of forest goods or with social capital outcomes. Sixty-four articles focused on actions related to markets (enterprises and livelihood alternatives; market access and forces) with most evidence correlating these actions with monetary income through direct sales of forest goods and wage labor. Finally, 76 articles report evidence on the links between actions related to ecosystem services management and enhancement, stronger institutions and markets for ecosystem services and welfare outcomes with their impacts on monetary income through direct sales of forest goods and wage labor. Overall, capital and asset dimensions of poverty were comparatively less studied, with the exception of social capital (n = 66) and physical capital (n = 54). Only one article examined identifying non-monetary benefits. Linkages between any activity and changes in health, along with changes in natural capital in terms of land assets were explored in very few articles. Nine systematic evidence syntheses (seven systematic reviews and two evidence gap maps) were included in our study (Table 3). In general, the systematic reviews converge with areas that have high occurrences of evidence including links between forest management, governance, linked enterprises/livelihood alternatives, and managing/enhancing ecosystem services across the majority of poverty dimensions (Fig. 11). Our systematic map had 55 overlapping articles with those captured in the nine evidence syntheses reviewed. Differences in which studies were included between this synthesis and the others, are most likely due to the differences in scope and to inclusion criteria. We found that the two evidence gap maps covered similar linkage areas as we did and also found similar knowledge gaps (Table 3). For example, both Puri et al. and Snilsveit et al. did not find any articles on the impacts of forest conservation and land-use change and forestry programmes (respectively) on human health. Documenting causal mechanisms can be fraught with difficulties, thus, this systematic map aimed to be as comprehensive as possible in accounting for attempts to causally link forest-based activities to impacts. We documented whether articles attempted to utilize any type of conceptual or causal model or framework to frame their study, inform study design, and/or validate a model with empirical data. Only 29 articles used a conceptual model in this way. Models fell into the following types: conceptual models or frameworks (n = 18), theories of change  (n = 4), results chains  (n = 2), logic models  (n = 1), or unknown (n = 4). Models generally were used to frame the study (n = 19). Comparatively fewer were used to infer a model from the data (n = 2) or analyze data (n = 2). Finally, only a handful of studies (n = 5) used models to validate data. This study provides an up-to-date systematic map documenting the state of evidence on the contribution of forest-based productive activities worldwide to changes in poverty. The resultant map highlights several knowledge gaps and biases in current research efforts, including a relatively heavy concentration on specific geographic areas, and linkages between intervention and outcomes types. In particular, it highlights a number of absolute evidence gaps (where limited or no evidence exists) as well as synthesis gaps (where substantial volume of evidence exists, but lacks synthesis). Absolute evidence gaps exist (1) between all forest management intervention types and impacts on human health, (2) the impacts of investments in produced, human, and social capital in forested landscapes on all dimensions of poverty, and (3) the impacts of efforts to identify non-monetary benefits of ecosystem services (e.g. cultural and spiritual values and uses of forests) on all dimensions of poverty. Synthesis gaps are found at the intersections of (1) governance and individual rights/empowerment on capitals and assets and (2) impacts of livelihood alternatives/linked enterprises on incomes and consumption. We discuss these gaps in greater detail in the following sections. While the search strategy employed to generate this map was designed to capture the breadth of relevant topics, it was not exhaustive (i.e. does not attempt to capture all existing evidence) due to finite time and resources. Thus, while we attempted to capture the diversity of terminology in use across multiple relevant disciplines, we recognize that terms that may have been missed may result in bias in our evidence map. First, the search was limited to English language only. We recognize that a substantial volume of literature likely exists in other languages, for example in French, Spanish, Portuguese, Farsi, and Chinese, however, we did not have the resources to conduct these searches. Second while we searched the bibliographies of eight systematic evidence syntheses, we did not conduct forward and backward citation screening of included primary literature. Nevertheless, because we have clearly and transparently outlined our search methodology here and in the original protocol , this search can easily be updated in the future with additional sources. Third, the topic of this systematic map straddles multiple disciplines and sectors (conservation, development, natural resource management), thus substantial semantic diversity is more than likely to exist. Unlike medical fields, these fields lack a standardized ontology [44, 45] and are characterized by rapid radiation of terms in use over the past few decades. While our search strategy attempted to capture this diversity through piloting and testing with an interdisciplinary and multisector review team, we recognize that not including specific terms in our search may have resulted in literature areas missed. In addition to limitations to the search strategy, we highlight several caveats regarding the screening procedure, how data were synthesized, and how it is presented, that should be considered when interpreting this systematic map and using it for decision-making. First, while the studies included in this systematic map are critical for understanding the current state of knowledge, there is also significant insight to be gleaned from those that were excluded. Many of these were narrative case studies, which likely contain important contextual information that may not be always captured in a quantitative, counterfactual study. Another significant portion of excluded articles were ones that employed solely qualitative data to explore people’s experiences and perceptions of changes in poverty dimensions. Research design is critically important to ensure reliability and robustness of evidence for decision-making and understanding causal impacts, and while quantitative study designs using counterfactuals are the gold standard for conservation and environmental research, arguments can also be made regarding the important insights that qualitative studies provide (see ). Excluding qualitative study designs and narrative case studies with no comparators likely influenced the low number of articles examining impacts on social capital (e.g. 64 articles in McKinnon et al. documented impacts of forest conservation on social relations (an element of social capital) using qualitative study designs, while an additional 25 articles did not use a comparator). However, due to limited time and resources, qualitative studies were not included in the scope of this map. They are identified in Additional file 4 for future examination and consideration for synthesis. A major finding from this systematic mapping effort was the overall lack of impact evaluations employing a credible control. Without such an appropriate comparison site, it is unclear whether any observed changes in outcome can be attributed to the studied action or intervention . This is particularly the case where the causal chains linking activity and outcome may be complex and/or long. While the value of this kind of impact evaluation is widely recognized for understanding the impact of conservation and development projects [39, 40, 47], applications of impact evaluation methods in peer-reviewed literature in conservation, natural resource management, and development fields remains limited [48–50], particularly in relation to long-term impacts . This systematic map did not critically appraise the quality of included impact evaluations, which limits our insights into the overall reliability of the evidence base to robustly measure impacts. However, while we cannot make any statements on the direction of impacts being measured, we can definitively state that much of the potentially relevant research that was recovered in searching did not utilize any type of comparator, which limits their reliability to link impacts to actions. Furthermore, the majority of studies did not employ any type of causal model or conceptual framework about how actions were thought to lead to outcomes, to either justify nor test hypotheses, or frame study design nor analyses (n = 25). In order to understand what types of actions will deliver poverty alleviation outcomes, we need well-designed studies that allow for confidence in testing and validating causal linkages between actions and outcomes . The lack of use of explicit causal thinking is particularly concerning as it implies that we are continuing to ‘shoot in the dark’ when it comes to understanding what works . While global in scope, India and Nepal are two of the top studied countries, likely reflecting a boom of research following implementation of two major forest-based development initiatives in each country (Joint Forest Management initiated in 1990 in India and Community Forest Management initiated in 1993 in Nepal) . China similarly has a high concentration of studies, followed by other well-studied regions of the world that lie within tropical forest zones and are also areas of concentrated and widespread poverty  (e.g. South Asia, Southeast Asia, South America, Eastern Africa). Importantly, however, high study concentration within a country does not imply even distribution of study efforts through all forested regions within national boundaries. This is a significant gap, particularly in regards to calls to understand what is effective for poverty alleviation and ecosystem sustainability and to scale these efforts across landscapes [2, 10]. However, insight into how to apply insights to different situations and decisions is limited when the context for learning lacks contextual diversity. Thus, we encourage increased research efforts and funding for such efforts in broader forest landscapes to deepen the evidence base for geographic representation. This systematic map has revealed a significant skew towards measuring change in poverty through changes in monetary income, with an emphasis on cash income obtained from the direct sale of forest goods. This focus in the evidence extends less to changes in monetary income stemming from wage labor and value addition, and even less on measures of change in capitals and assets. There are likely at least two reasons for the current emphasis in the literature. First, income measures are often easier to interpret and compare over different temporal and spatial scales, facilitating their use by researchers and evaluators. Measuring change in annual or monthly household and individual income and income diversity can be done using data from large-scale surveys from national statistics offices and international organizations (e.g. Living Standard Measurement Survey, [LSMS], Labor Force Survey [LFS]), although in most of the world poverty is measured through consumption, as the latter is less seasonal and can be smoothed and more related to current living standards . Second, our systematic map included only studies that utilized quantitative or mixed methods data, which could unintentionally bias the map away from capturing poverty dimensions more easily measured through qualitative means. For example, human capital and social capital, which include many intangible dimensions such as sense of well-being, learning and perspectives, are not captured readily with quantitative designs. While certain dimensions of poverty were well-studied, our results indicate that how changes in poverty are distributed between sexes, different demographic groups and social strata is not as well studied (Fig. 9). Yet we know there are many differences in how, why and where men and women, and more empowered versus less empowered individuals and groups, access, use, manage and benefit from forests [57–59]. Thus, pathways out of poverty for women, who are often the most forest-dependent, typically differ from those of men, and may require different types of interventions. The limited literature addressing gender in the context of forest landscapes suggests that participatory consultations, gender working groups and learning networks [60–62], gender-sensitive disaggregated data collection, monitoring and evaluation systems [61, 63] and new benefit-sharing models  can help address intra-household poverty. However, we are still not able to identify evidence of the impacts of such strategies in forested landscapes. Pro-poor policies and strategies aim to alleviate poverty as well as reduce poverty—goals that while are interlinked and synergistic, require different actions at different levels to address specific drivers of poverty. Poverty alleviation strategies tend to act primarily through practical and direct changes at local levels to address direct drivers of poverty (e.g. materials, subsistence, income) [65, 66]. On the other hand, poverty reduction strategies tend to encompass both practical and strategic approaches that address both direct and indirect drivers of poverty at multiple scales. For example, through efforts to strengthen rights of poor people and build capacity and infrastructure to sustain poverty-free societies . There has been substantial emphasis and international effort towards poverty reduction, especially in forest ecosystems, since the inception of the Millenium Ecosystem Goals. However, this evidence map shows that research focus appears to be on specific aspects of forest actions that act directly on people or forest resources (Fig. 10) and less on how changing infrastructure around these initiatives can have an impact despite considerable development literature that emphasizes the need for capacity building and improving social/economic/political atmospheres required for facilitating poverty reduction [68–70]. For example, there were comparatively fewer articles that examined market-based activities and investments (aimed at increased produced, human, and social capital), as well as natural capital (forest or land assets with access, use, sale, or exclusion rights) and health outcomes. In relation to the P.R.I.M.E. pathways, this raises concern that much of what we understand about forest-poverty linkages are limited to localized cases where forests are directly tied to changes in livelihoods (e.g. through Productivity), but we have far less clarity around effects to change the overarching systems within which forests and people operate (e.g. Investments and Ecosystem Services). These gaps are particularly concerning given the current scale of implementation of forest-based development activities that aim to harness market forces and increase investments in institutions and infrastructure to strengthen sustainable forest management (e.g. participatory forest management projects, currently being implemented by the World Bank in countries such as Laos, Ethiopia or Kenya). While the limited evidence base may give pause to rapid and widespread implementation of these types of activities, it is also a clarion call for implementers to design robust monitoring and evaluation plans to capture a broad range of poverty dimensions over a sufficient timescale to observe demonstrable change. Furthermore, these gaps may represent outcomes that may be more likely to take significant time to manifest, often beyond the life cycle of a program or project. Thus, future evaluation of efforts falling in these linkages may be able to use “predictive proxy indicators”  or other techniques to shed light on longer-term outcomes. Our results suggest at least two areas in which the evidence warrants more detailed synthesis and analysis of impact (“synthesis gaps”). The first relates to impacts of rights-based activities within forest ecosystems on all dimensions of poverty. Forest policy has increasingly sought to focus beyond specific management approaches, towards creating and strengthening governance and rights in an effort to ensure sustainability of forest resources and improve human well-being [71, 72]. Our study recovered a substantial volume of articles in this topic area. While there have been some systematic reviews examining the links between rights-based actions and poverty, including in forested landscapes, they are narrow in scope and based on evidence that has not been updated. Current evidence in this area now merits synthesis to investigate causal mechanisms and critical contexts for achieving impact. This systematic map also revealed potential interactions between forest management and rights-based approaches with 54 articles examining the impacts of programs incorporating both approaches. Thus, given long held hypotheses that successful forest management must be accompanied by activities that define and enforce access and use rights and assign responsibilities for management [32, 57, 58], deeper, updated syntheses present opportunities for assessing optimal program design for rights-based forest management. The second area with potential for deeper synthesis relates to the impact of actions around ecosystem services. Our results show significant occurrence of evidence around efforts to manage and enhance ecosystem services, for example through payments schemes, protecting critical ecosystems, and providing mechanisms for linked-livelihood benefits. However, it also shows significantly less available evidence around the impacts of strengthening institutions to manage and deliver ecosystem services and identify and value their non-monetary benefits. This gap poses a particularly policy-relevant area to explore, especially in the context of understanding who the winners and losers may be of different approaches generating monetary and non-monetary benefits from ecosystem services. Further synthesis in this area could lead to a clearer understanding of specific knowledge gaps on constructing stable mechanisms that ensure equitable and sustained delivery of ecosystem benefits across social-ecological systems. Further empirical evaluation is needed to document the relationship between particular strategies to alleviate and reduce poverty (“absolute evidence gaps”), in particular for mechanisms commonly assumed in development strategies and global policy goals. Despite significant emphasis on market-focused strategies (e.g. development of sustainable forest value chains, promotion of small- and medium sized forest enterprises), we found that these mechanisms are not particularly well-studied and merit further empirical investigation. In particular, actions to improve market forces (e.g. certification schemes, value chain analyses, creating forest funds) and improving access to markets (e.g. producer/forest user group networks and platforms, credit access) were not well documented in the evidence base, particularly in relation to livelihood alternatives. This systematic map illustrates the quantity and distribution of evidence across forest activities and poverty dimensions. It does not, however, illustrate nor detail underlying quality of individual articles as we did not conduct a critical appraisal. In the heatmap, it is important to remember that higher occurrences of evidence do not necessarily imply high quality evidence, nor positive impacts. Thus, if a linkage is characterized by many studies, it does not mean that the intervention is effective—only that it is well-studied. Further systematic review is required to gauge the overall effectiveness of a given intervention type. The systematic map can be used to support the location of evidence to inform the design of studies, policies, and practical interventions, and to strengthen monitoring and evaluation frameworks following the inclusion and exclusion criteria. The map does not formally assess the direction of the impacts, leaving this important task for future evidence synthesis. But this map does present important results to guide this effort and provides a comprehensive resource on evidence gathered to date. It details where effort and investment in gathering evidence has so far focused, including the type of forest-based interventions and poverty measures studied. Crucially, it also shows where more research is needed. In particular, research and evaluation efforts should consider collecting data on non-monetary dimensions of welfare, and health, along with a wider range of monetary dimensions including assets and wage income. Additional research on impacts by social group across different contexts is also needed. Such work could provide much-needed evidence on a wider range of ways that forests may contribute to reducing poverty in its multiple dimensions. In summary, this systematic map provides a comprehensive picture of available evidence on forest-poverty linkages globally. In so doing, it presents a resource that can support on-going efforts to advance knowledge of forest-poverty linkages and practical efforts seeking to reduce poverty and advance other UN Sustainable Development Goals, and acts as a benchmark for other initiatives to build and expand on . MM, DM, and SA conceived the study and secured funding support. SC lead development of the scope of the systematic map and design of search strategy, with input from all authors. SC implemented the search strategy. SC, KM, and PR conducted screening of articles for inclusion. SC and KM coded included articles. KM conducted the grey literature search, screening, and coding. All other authors provided feedback and second opinions on screening and coding. SC conducted analysis and presentation of data. SC, KM, SA, EP and DM wrote the manuscript and all authors provided critical review on a draft version. All authors read and approved the final manuscript. The authors would like to thank the members of the PROFOR reference group who met in November 2017 (hosted by the World Bank) to provide feedback on this systematic map. We would like to express our gratitude to the anonymous reviewers who provided critical feedback in the development of the protocol and this systematic map. Finally, we would like to express our appreciation for the critical guidance and support from Kenton Russell, who developed the interactive online database and visualization platform for the data contained in this study. All data generated or analysed during this study are included in this published article (and its additional files). We are grateful for funding support from the Program on Forests (PROFOR) (SA, SO, SC, RG) and the USDA National Institute of Food and Agriculture, Hatch Project #1009327 (DM, PR). 13750_2019_148_MOESM1_ESM.xlsx Additional file 1. List of peer-reviewed and grey literature sources searched. 13750_2019_148_MOESM2_ESM.xlsx Additional file 2. Codebook and data extraction questionnaire. 13750_2019_148_MOESM3_ESM.xlsx Additional file 3. List of included studies. 13750_2019_148_MOESM4_ESM.xlsx Additional file 4. List of studies excluded at full text assessment with exclusion criteria indicated. 13750_2019_148_MOESM5_ESM.xlsx Additional file 5. Full coded data for systematic map. 13750_2019_148_MOESM6_ESM.xlsx Additional file 6. ROSES Reporting Form. Haddaway NR, Macura B, Whaley P, Pullin AS. ROSES flow diagram for systematic reviews. Version 1.0. 2017. https://doi.org/10.6084/m9.figshare.5897389.